Don’t be fooled by Half Pint Creamery’s formal brick exterior. 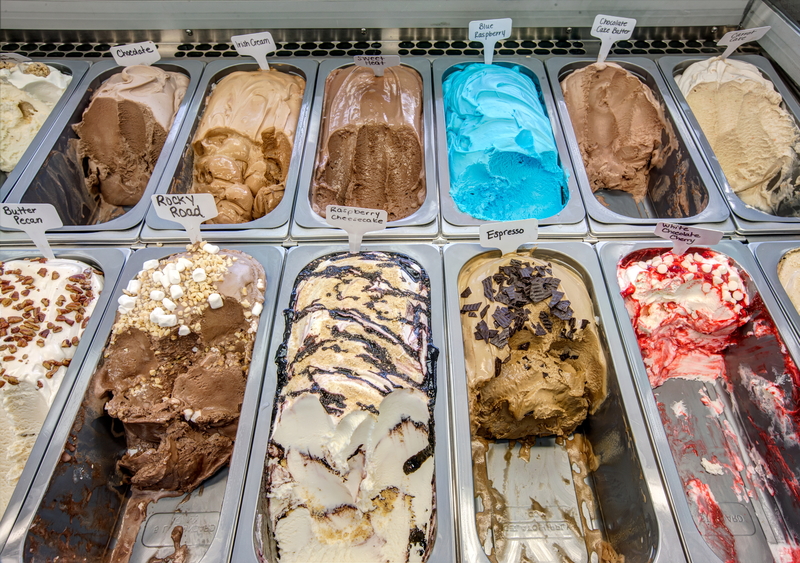 Walk in and catch the aroma of freshly made ice cream cones coaxing you to the ice cream case. It’s a carnival of colors packed with flavors bearing whimsical names like Sweet Heat and Coconut Paradise. The former bank building is now an ice cream wonderland. Located at 1101 Biglerville Road in Gettysburg, Half Pint Creamery is celebrating its second year of serving cones, cups, floats, and shakes all made with owner Trish Motter’s handcrafted recipe. This is her second shop. She opened in McSherrystown three years ago, and her third location in New Oxford will open this summer. Opening three shops in three years is challenging, but 25-year-old Motter is taking it in stride. “The more I put on my plate, the more things I’ll get done,” she says. “At first it was overwhelming,” she admits. There were nights she made ice cream all night and ended up sleeping at the shop. She has since trained others to make the 36 rotating flavors on the menu. “Our ice cream is handmade with premium ingredients of the highest quality,” says the graduate of the Penn State short ice cream course. It’s made in small batches that are served within 72 hours. A few factors make Half Pint different from the rest, according to Motter. Not the least is the ice cream machine used to make the base. “I ordered it from Italy, and it took 6 months to get here,” she says. As for flavors, Motter says she has the ability to taste something and make it into an ice cream. One morning she had a cinnamon bun for breakfast and decided to make cinnamon bun ice cream. No tedious experimenting; she just made it. Trish and Sentz opened the Gettysburg shop together. “I grew up on a farm and my dad taught me everything,” says Sentz, the self-described jack-of-all trades. Sentz has done a lot of the construction and painting at the shops, along with making ice cream. The couple works in harmony to create shops that are attractive, orderly, and customer friendly. Sentz describes his future wife as a “spitfire” for her dedication and drive. They both advocate being your own boss and credit their parents’ examples as strong influences. Trish’s parents have owned businesses for years and currently own both the Biglerville Laundromat and Biglerville Car Wash.
“Today my wife and I work for Trish in Gettysburg. I’m extremely proud of her,” her father Greg adds. Two scoops of two different flavors in a cone is the most popular order. The cones are freshly baked every day and are crisp with a hint of vanilla. Trendy Salty Caramel is the current favorite flavor. Apple Pie is like eating luxurious pie á la mode. Adventurous chocolate lovers, Sweet Heat is for you. After the smooth milk chocolate caresses your mouth, the cayenne pepper gently kicks your palate. Signature Sparkle Dust is a simple topping. It’s basically edible glitter that comes in pink and blue and adds a bit of sugary sweet fun. Extra thick shakes challenge you to get the goodness through Half Pint’s extra-wide straws. Half Pint Creamery also makes pup cakes and bone appetites for our canine friends. One of the most unusual special orders Trish fulfilled was for a dog’s birthday party. She made a pup cake for the guest of honor and an ice cream pie for the people attending. Look for the glitter wall near the doors. It dazzles in extra bright sparkling teal, Trish’s signature favorite color. “It’s fun!” Trish and Sentz say simultaneously. Preheat oven to 350 degrees. Line a loaf pan with parchment paper and grease with a nonstick spray. Combine ice cream, flour, and vanilla in a bowl. Mix until well combined. Add sprinkles and chocolate chips if desired and mix into the batter. Pour batter into loaf pan and spread evenly. Bake 35 to 40 minutes. Allow to fully cool before cutting. Top with ice cream.